An invitation to speak at the International Conference on Obesity (ICO) in Kuala Lumpur led to a whirlwind tour of 3 cities, a talk at the National Sports Institute, and several meetings with IPEN investigators. It was my first visit to Malaysia, and I learned how the rich mix of cultures makes for a vibrant experience. 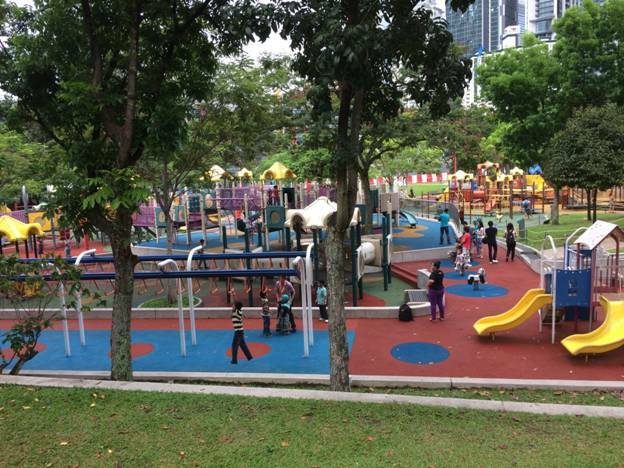 I was particularly impressed at how happy and friendly the Malaysian people are. However, my visit occurred a few days after the disappearance of Malaysian Air flight 370, so the unknown fate of the people on board was constantly in the news and on the minds of everyone. At the ICO, I spoke in a session on the “exposome”. I asked who knew what an exposome was and only one hand went up. I told them it was still OK to refer to “environments.” I was encouraged that the session was full, with some people standing at the back. My talk focused on the expanding literature on evaluations of environment and policy interventions. A few people tweeted about my talk and others in the session. I want to congratulate Steve Blair who received the Population Health award at the conference. Wan Manan is leading IPEN-related studies of adults and adolescents in Malaysia. The studies are being conducted in different cities, and he has assembled an excellent team. Marc Adams, now of Arizona State University, made the trip to provide instruction and guidance on creating GIS variables. 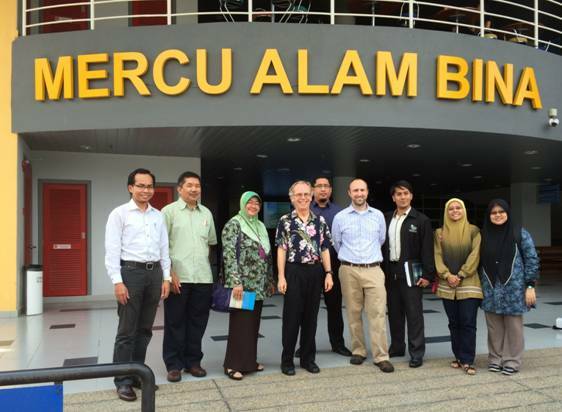 The first meeting with IPEN investigators was held at the University of Malaya, at the Faculty of Built Environment. This was a new concept to me, but it made sense to pull the disciplines together with expertise in the built environment. After the meeting we toured potential study neighborhoods, a park, and a school. Here is the IPEN group in front of the Faculty building. 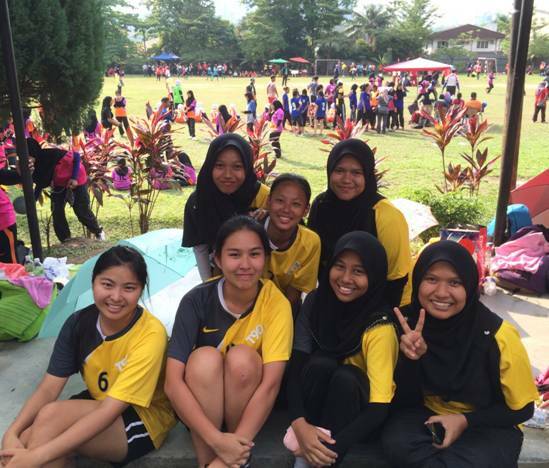 We visited a high school where they were having a girls’ handball tournament after school. Handball is like soccer but using the hands. 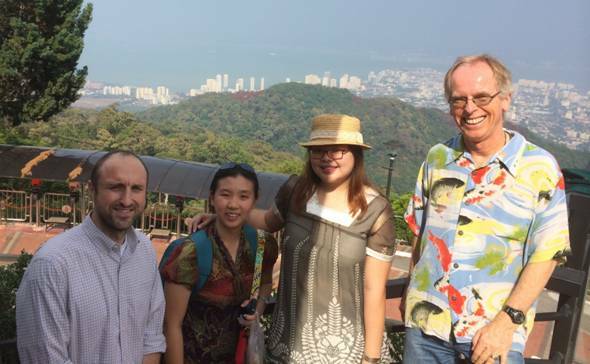 Marc and I then flew to Penang to tour some more potential IPEN study neighborhoods. We had two able and enthusiastic tour guides, Yi Yi Lee and Shuwen, who both work on IPEN studies. They have degrees in nutrition so we had a great food tour as well. Here we are getting an overview of Penang. After a hike through the rain forest we toured the old part of the city, which was designed to be walkable but had too much traffic. 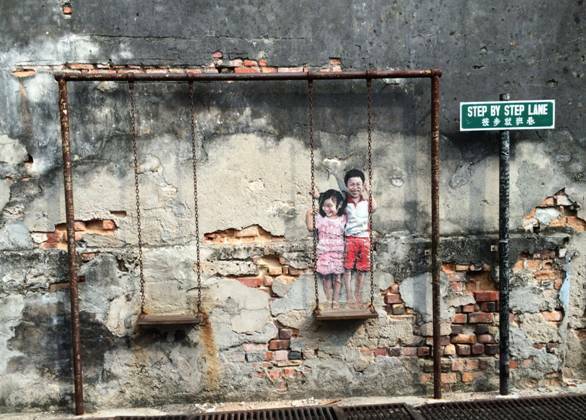 A recent signature of Penang is an explosion of mixed-media murals. The murals appear to be attracting many tourists, suggesting this is a promising approach to art for economic development that also encourages walking and biking. Several of the murals have physical activity themes, including this one. It looked to me like Malaysia has embraced automobile dependence, and pedestrian and bicycle infrastructure was not a priority. Here is an example of the downside of lack of attention to pedestrians. 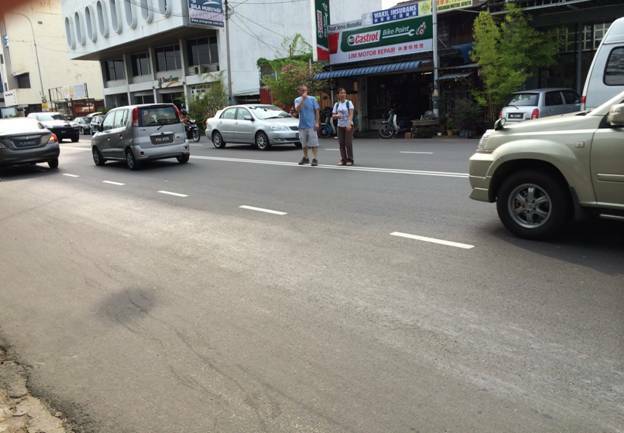 Here are Marc and Yi Yi risking their lives to cross a busy road with no intersection controls to get to a major tourist destination. Finally, we traveled to Kota Bharu, where Wan Manan is based. We met at the Universiti Sains Malaysia, School of Health Sciences. The main topic again was GIS variables and neighborhood selection. It seems like each city has different GIS variables available, which is a common challenge for this type of work. But the team in Malaysia is well prepared to conduct two excellent studies. It was a treat to work with them. 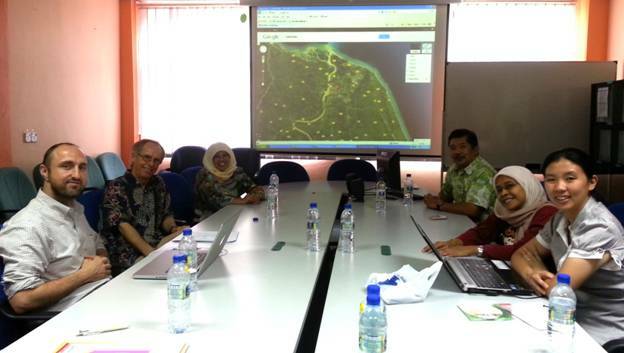 Here is the group meeting in Kota Bharu. 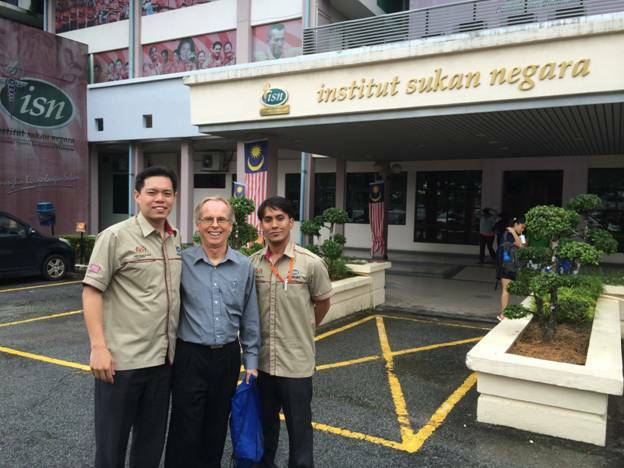 An unexpected opportunity arose to speak to the National Sports Institute in Kuala Lumpur. They recently started an Active Living program, and the Ministry of Health is looking to the Institute to provide guidance on physical activity interventions. Thus, I had a receptive audience for my talk on the need for collaborating with multiple sectors to design, implement, and evaluate multi-level interventions. We had a deep discussion with a small group afterwards about using research to inform policy change. I was pleased to learn they are evaluating a national campaign to increase physical activity and are studying the energy expenditure of traditional Malaysian games. Here is a photo of Yeo Wee Kian and Zack Ghazali who work at the Institute. The hospitality at every stop on this trip was outstanding and humbling. I especially want to thank the organizers of ICO, Wan Manan, and Yi Yi Lee for making all the arrangements and ensuring my trip was enjoyable and stress free. It was a great introduction to a wonderful country, and I hope I have the chance to return. By drjamessallis in Uncategorized on March 27, 2014 .